The House Judiciary Committee and the Immigration and Naturalization Subcommittee received much correspondence from individuals and groups explaining how national immigration quotas adversely affected them. 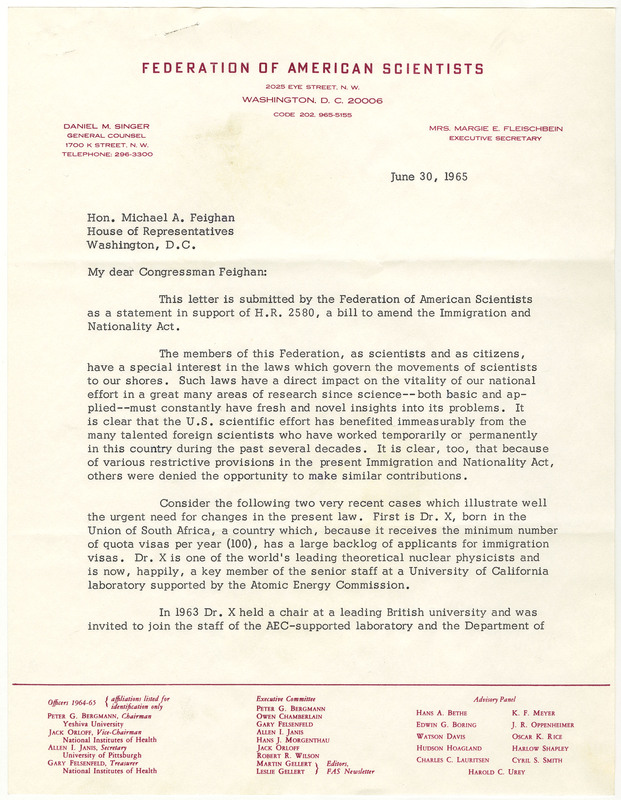 This letter from the General Counsel of the Federation of American Scientists provided two examples of how the quota system made it impossible for a South African and an Asian scientist to obtain immigrant’s visas. United States. Congress. House. Committee on the Judiciary. "Daniel M. Singer to Michael A. Feighan on Immigrant Visas." Daniel M. Singer to Michael A. Feighan on Immigrant Visas, June 30, 1965; filed with Feighan to Singer, July 13, 1965, “H.R. 2580 (Gen Corr.) 2 of 3” folder, Legislative Files, Box 75; Committee on the Judiciary; 89th Congress; Records of the U.S. House of Representatives, RG 233; National Archives.. Accessed 21 April 2019. http://acsc.lib.udel.edu/items/show/308. Daniel M. Singer to Michael A. Feighan on Immigrant Visas, June 30, 1965; filed with Feighan to Singer, July 13, 1965, “H.R. 2580 (Gen Corr.) 2 of 3” folder, Legislative Files, Box 75; Committee on the Judiciary; 89th Congress; Records of the U.S. House of Representatives, RG 233; National Archives.